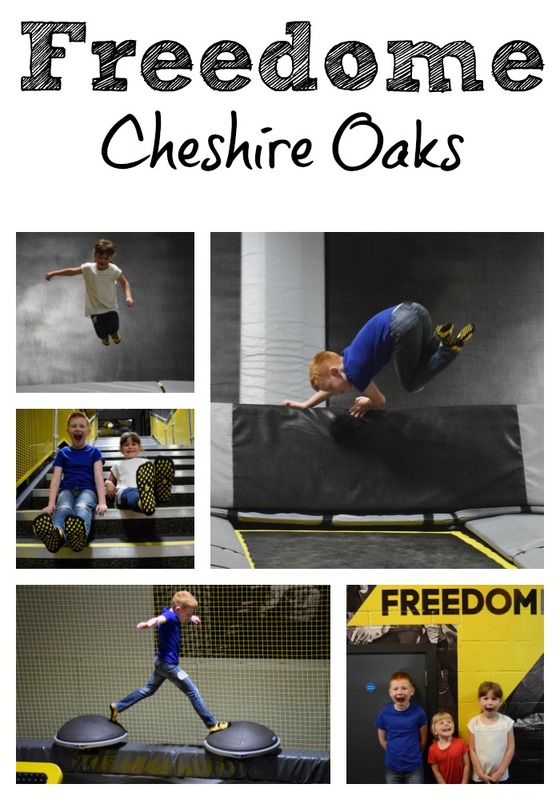 FREEDOME, Cheshire Oaks is more than just a trampoline park. 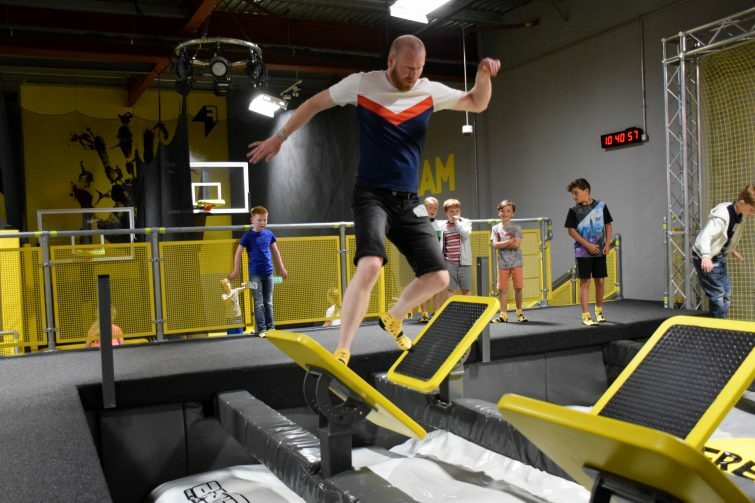 Situated above the bowling alley on the Coliseum Leisure Park next to the Cheshire Oaks Outlet Village, FREEDOME is the next generation of Freestyle Aerial Parks and I just knew that Ben was going to love it! 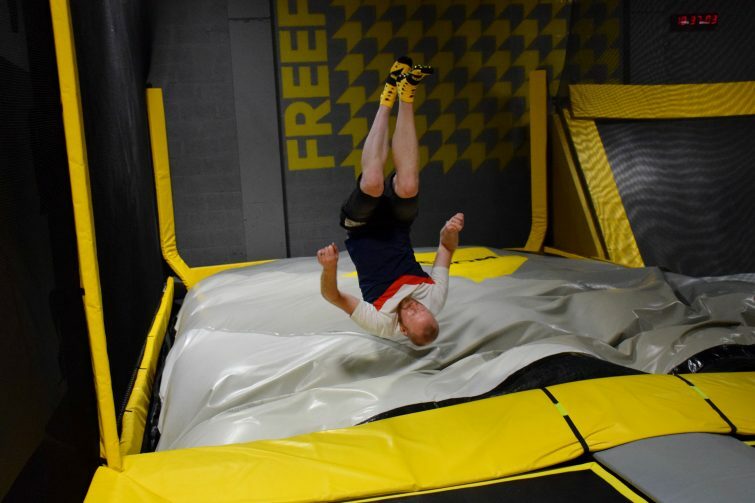 Before you can jump at FREEDOME you need to fill in a fairly long Risk Acknowledgement & Waiver Form – this can be completed online at home to save time on arrival or on one of the screens in reception. It does rather feel like you’re signing your life away but essentially you’re agreeing to take full responsibility for yourself and your children on site. Once you’ve signed the forms you’re given a sticker with your jump times on to be worn on your clothes. 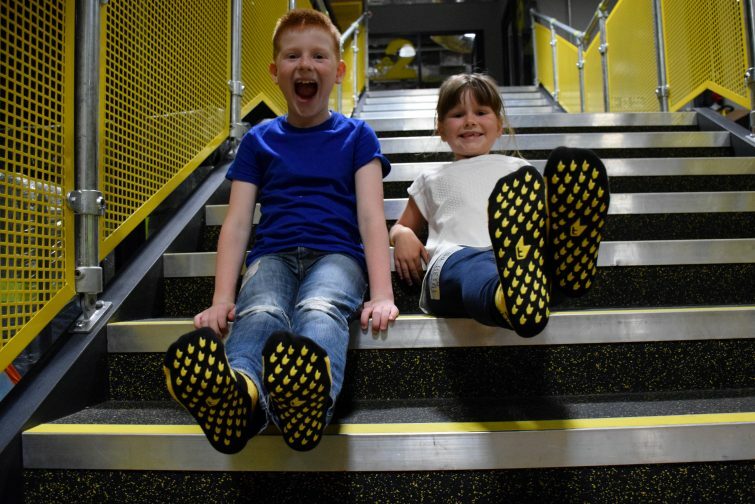 You will also need to take off your shoes and slip on a pair of bright yellow & black FREEDOME socks (these are compulsory and cost £2 a pair). 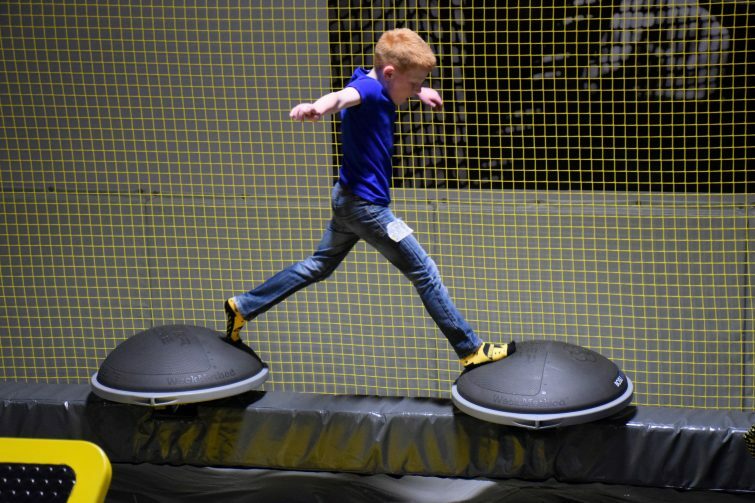 Finally, there is a safety video to watch before you are let loose on the trampolines! 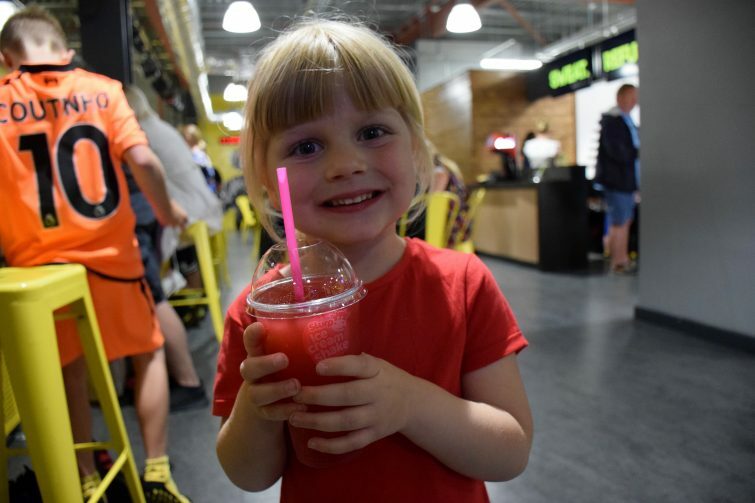 Is FREEDOME Park suitable for under 5s? Whilst Ben and Chloe were busy bouncing, Amy and I watched from the sidelines for a bit and then moved up to the cafe and viewing area where I treated her to a slush – I must admit that the service was a little on the slow side and whilst there were tables available, there was a distinct lack of seating at the viewing window, not helped by people “reserving” seats for friends and family who were down next to the trampolines. Obviously you want to be able to keep an eye on your children while they are jumping so this meant lots of people were just stood – and I had to hold Amy so she could see until a stool became available. Of course this is just a minor irritation but worth mentioning just the same. 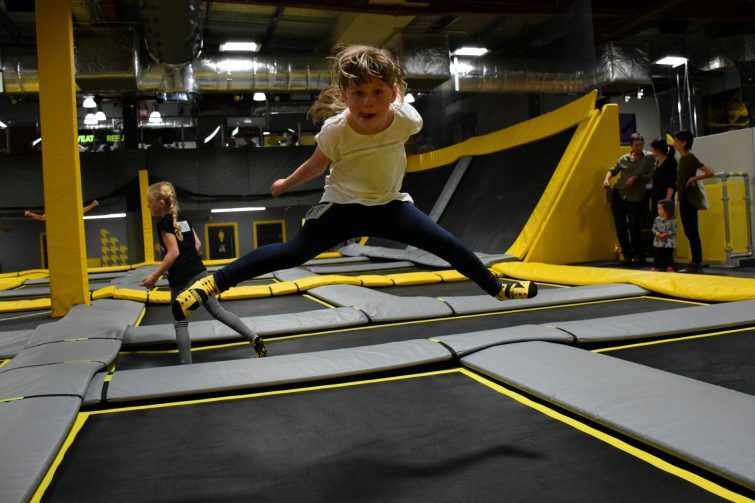 The Freestyle court is comprised of a large interlaced trampoline bed with pathways intersecting the trampolines and sprung walls for bouncing off! 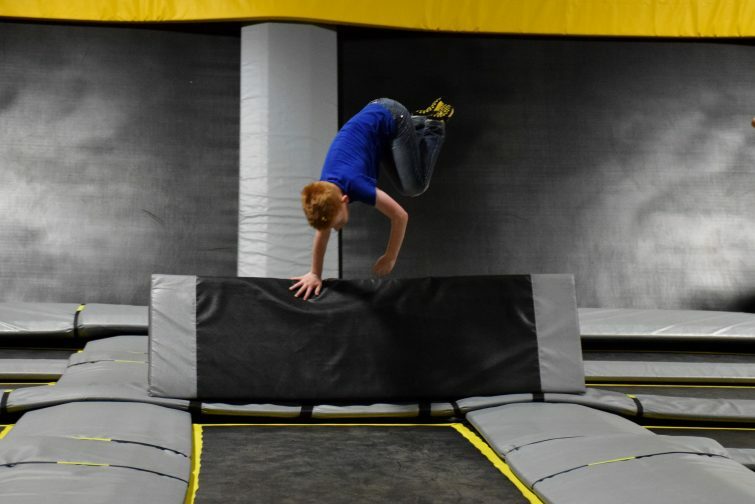 It’s really important not to bounce on the same trampoline space as someone else and to use the pathways in between when moving around the Freestyle court. When we arrived at 10.30am there was plenty of space for jumping and even as FREEDOME got busier, I don’t think there was ever a time when they kids couldn’t find somewhere to bounce. 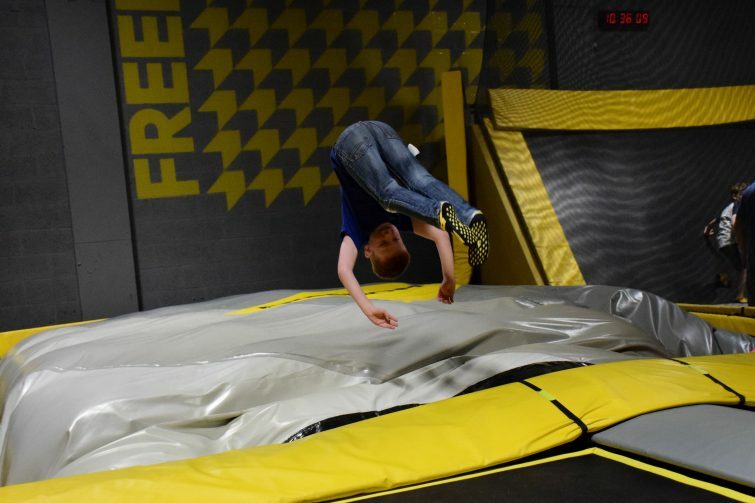 Ben particularly loved the longer stretches of trampoline that allowed him to perfect his front flips or spring over the obstacles. The Warrior Course is akin to the Ninja Warrior TV programme that Dave and Ben have enjoyed watching in the past so Ben was keen to crack on and have a go. There were two routes across the course and one was definitely much harder than the other – so Dave obviously had to have a go at that one! It’s a matter of pride isn’t it . . . ? The Ultimate Dodgeball courts do exactly what they say on the tin and give you the opportunity to practice your dodgeball skills with your mates – we didn’t try this one out as I’m not sure that Chloe would have particularly enjoyed having people chuck balls at her! In the back corner is the FreeSlam – for practising and perfecting those trick-shot slam dunks – again not something we tried out with Ben and Chloe this morning, though I think Dave would have quite enjoyed it given half the chance. For those of you wanting to practice your tricks and flips or basically just chuck yourself about a bit, Freeform is the place for you. The enormous airbag provides a safe landing which Dave & Ben had lots of fun with but turned out to be a huge source of frustration for Chloe who just didn’t have the nerve to follow through on the flips she was so desperate to master! Lexi’s Ladder proved to be too much of a challenge for Ben who fell off the first rung of the wobbly rope ladder every time he tried – thankfully there’s a super soft foam pit to cushion the blow! In the middle of the session, we were surprised when the lights were turned down low and the UV lighting turned on so that everyone’s socks glowed up in the dark along with the white sections of Dave’s t shirt and lots of fluorescent clothing that some of the other children were wearing. It was rather reminiscent of the Sunday mornings I spent in night clubs many moons ago! This was just a taste of the Glow sessions which take place on Friday & Saturday nights featuring UV lighting and house music – it sounds like a lot of fun! How much does FREEDOME cost and how long can you jump for? 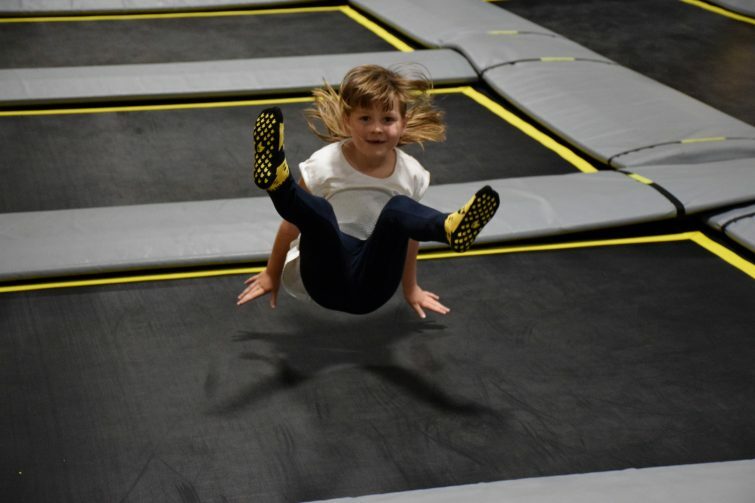 An Open Jump can be booked in for 1 hour, 90 minutes or 2 hours. Knowing how much Ben and Chloe were going to love their time at FREEDOME we decided to go the whole hog and book them a 2 hour session (costing £15 per person). With hindsight I would suggest that 90 minutes would have been perfect. An hour seemed to be over very quickly but two hours was just too long – they were both exhausted and although they wanted to carry on jumping, you could see they were losing control of their limbs and Chloe was getting increasingly frustrated with herself. We ended up leaving about ten minutes early for our own sanity! Oh this looks like so much fun!! 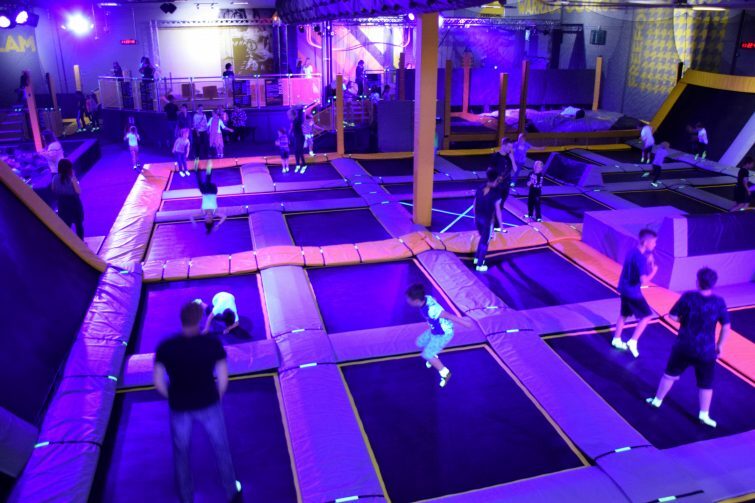 We love trampoline parks like this but have never seen one with uv lights – my kids would go crazy when that came on! It’s not far from us, I’d love to visit! Wow this looks amazing, I can see how older children would absolutely love this! The UV lights idea is so cool, bet all the kids thought that was amazing. Yes they were buzzing – they kept telling me it was “like a disco” ? Looks like you guys had fun there. The warrior course looks very challenging, no wonder they need you sign the form before going in. I would love to visit this place with the kids. Am sure they would love it. Oh babe this wipes the floor with my local ones! I love the idea of the UV, Sooo cool. Theres young bounce sessions at some of my local ones but still find them a little boisterous.